-=- Full "Retro Mortis" Series Article Index -=- Retro Mortis - RTS (Part 1) - It was found in a Desert... Retro Mortis - RTS (Part 2) - Then a Blizzard came... Retro Mortis - RTS (Part 3) - Forged in Steel... Retro Mortis - RTS (Part 4) - A New Hope? Episode IV: A New Hope? If you're reading this and haven't read the previous installments of this series, I recommend you start with the above links to the original "part 1 - it was found in a desert" to keep everything in context. The heroes are the most powerful units. They need to be kept alive as much as possible and have sufficient escorts in the early game. The heroes need to be leveled, farming from their whereabouts for XP and out-leveling their opponents (which may be considered another way of out-teching the opponent in several ways). Creating a hero unit is critical, and knowing when to risk a hero is important (adding to the previous timing sequence of 'expanding your base'). Choosing which heroes to field is paramount (as their count is limited). It is unclear why Blizzard did not resume making Warcraft RTC games after this point. Perhaps by fear of cannibalizing their MMO, or because they felt they had dug the deepest they could along the idea of 'heroes' and that Starcraft was doing a far better job as a classic RTS? Notable titles that paved the way for "heroes": - Total Annihilation (the "Commander" unit) - Herzog Zwei (Avatar-Centric) This one is worth a look as it predates even Dune II and had a very MOBA-like feel for its time. Ground Control is but one example along a series of game that have attempted to abstract the RTS genre. There are no buildings to create, and no resources to harvest from the field. Rather, players are rewarded money for capturing and holding key locations on the battlefield, and they get to order reinforcements to any Landing Zone under their control. This approach mimics more closely modern combat and has a pacing that is more realistic (no one expects someone to build a base + factories under 20 minutes just because they need to fight). The simplified economy allowed to put more focus on Tactics, making Ground Control some kind of Real-Time Tactics game (RTT) as opposed to a true RTS, though the distinction is arguable. For the sake of this article, we'll classify this as an RTS with a strong focus on tactics. Much like the Ground Control series, Dawn of War I chose to put more focus on territorial control than resource acquisition. Though it retains classic elements such as base building, the resource system forces units to 'move out' and further prevents turtling. As players seek to protect more nodes, they effectively create fronts and flanks, mimicking World War II deployments. The inclusion of cover/vulnerable areas is a nice touch that reinforces the need to place units efficiently on the battlefield. Rather than simply capturing areas, players must think about where they'll place their units to defend it, and whether this is the right spot to capture at all (if all you have to defend it is a river in which your units are vulnerable, might be better to capture other nodes first). The inclusion of the Dark Crusade expansion finally closed the loop on a long-awaited upgrade to the Dune II campaign system, finally allowing players to conquer territories one-by-one and fighting an all-out war, one territory at a time. A similar mechanic was employed in a number of games, but Warhammer 40k Dawn of War w/ Dark Crusade demonstrated clear mastery and allowed an unprecedented level of control for the player in that regard. The Kohan series is an interesting one. 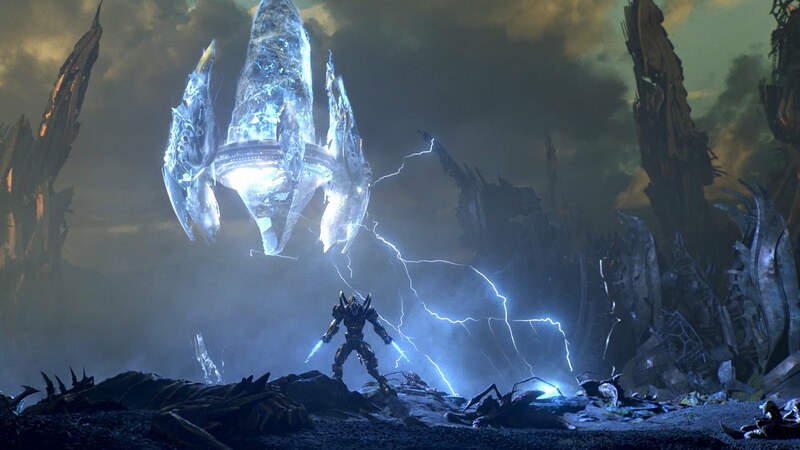 It reprised elements from the Warcraft series and moved away from the fast-paced competitive setup and rather moved towards a more tactically advanced integration of warfare. In a sense, Kohan was the Grand Strategy RTS of its time, choosing to minimize micro-management by grouping units into "companies" which could be customized before creation, and being more easily commanded into the battlefield. This allowed more design space for more tactically advanced features such as supply lines and their effect on combat. Kohan struggled a bit with its identity though as it fielded both Heroes (Kohans) and a game entirely focused on massive armies (companies) and the two seemed to work against one another in the core design, which may be in part responsible for the title's relatively low popularity. Regardless, Kohan's legacy was instrumental to the development of further RTS hybrid delving with logistics and more intuitive unit grouping in a realtime setup. Stronghold is a mix of city-building, tower defense and RTS combat. 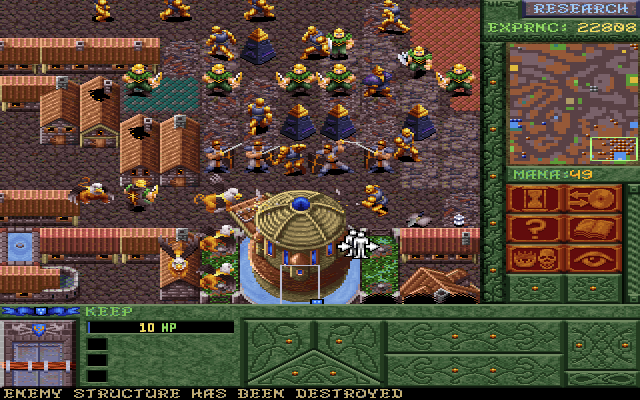 To allow more design space to city building, the developers chose to have the enemies show up primarily as units as opposed to bases. For this to work efficiently, they grouped the enemy units in assailing waves. The Game's economy model is so complex that it can hardly be compared to modern web-based Tower Defense games, and the pacing was also radically different (several minutes between waves). The storyline element was also much stronger. The ability to control free-roaming units and for the opponent not to be constrained to predetermined path also made it stand-out from the tower-defense model and look more like an RTS, but it borrowed heavily from the two. A few scenarios allowed Castle vs Castle battles which were particularly complex to handle and hard to balance as the game was clearly not made in such a way as to expect archers to be within hunting distance of peasants' foraging ranges. I haven't played Blood & Magic much personally, because the controls have aged significantly, but a mere playthrough of the first few levels quickly revealed an important element: the economy is drastically different: The 'Basal Golems' which are the core economic unit act both as harvester AND resource site, and can be moved around the map without any trouble (except that they don't produce resource during transit It is easy to identify how that makes for a strategically poor setup, as players evidently can hide these far behind their own lines and insure the opponent does not get to attack them, but it does modify the game pace signficantly. The tactical deficit of the game would materialise when a player would simply regroup all of their Basal Golems behind their military and couldn't care less for the opponent's ability to attempt to harrass them. More importantly, it was the controls that made the game hard to use: one had to cycle through all Basal Golems repeatedly to just earn the mana they needed (imagine cycling through all of the gold-mining peons in Warcraft every 10 seconds!). The game does have its merits though: The game was well balanced, the level design was great, and the brand was well leveraged from a lore standpoint. It's unique contribution however is its unique economy model which helped other titles rethink the whole "gold mine" approach. A number of RTS have chosen to focus on abstracting gameplay and limiting micro-management to the point where they simply automated some elements of the game and prevented direct control. Majesty: This game works by putting "GOLD" bounties for heroes to perform tasks for you. Roaming heroes are more likely to perform tasks when there's more GOLD on the line for them. The core idea was interesting, and a rather unique mechanic. Though a RTS at heart (with town-building components) the level of control was modified heavily. The Settlers series: Though the player does not have direct control over Settlers, they do command them more directly than in Majesty in that they choose which construction they'd like to have made and prioritize. The level of control is more direct than in Majesty, but micro-management is avoided nonetheless. Herzog Zwei: A rather unique and interesting blend of very early MOBA precursor (predating even DUNE 2!). 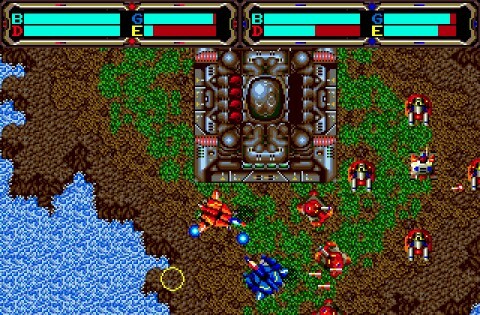 The game is not really a RTS in the common employed sense, as it does not grant the player actual control over much beyond their primary unit, the action involved is similar to RTS titles that were to come after. I find it fitting that this series should end with Herzog Zwei, a game I've never actually played, that actually predates Dune II, that was suggested by an avid reader of an earlier part of this very long article and that somehow embodies elements of a genre we believe was born not too long ago. When I started this article series, my goal was to clearly fight off the misconception that games from the 80s-90s were not sophisticated, that they were minimum viable products with limited features and vision. I opened up with Spacewar! and Dune II as my lead examples following this statement: The most common misconception I've seen modern players and junior designers exhibit about these precursors is the belief that they were barebone/simple experiences without much depth. From my experience, this could not be anywhere further from the truth, and oftentimes, I have come to realize that having a look at one of these "ancestors" humbles me. Herzog Zwei, to me, exhibits this in every capacity. It is a MOBA hybrid before MOBAs were even conceivable. MOBAs could not even technically exist until they were a modded map in Warcraft III, but someone at Technosoft apparently had an urge to put that kind of experience on the screen much earlier, but may have been limited by the capabilities of their time, though certainly not by design space. If there's one thing to draw from this is that several developers in those years did not bother to label the work they were working on with the 3 dreaded letters R.T.S. and rather chose to make a great game. For some, that turned out to be a conventional RTS (Warcraft I being the streamlined version of the hulking beast Dune II actually was) and to others, it turned out into something else altogether, and aren't we glad about it? And of course, now we have E-sports, the most recent evolution of RTS! [quote name="Wyrframe" timestamp="1448380410"]In the "limited input" category... no mention of Dungeon Keeper? For shame. ;)[/quote] Was actually part of my article plan but cut from the actual article due to lack of meaningful content to add. It's a good game I haven't played in forever but this article wasn't a popularity contest and I wanted to convey more about dusty features becoming commonplace rather than niche ideas and felt Dungeon Keeper belonged in the latter category. That's not to say there's nothing meaningful to say about it, in fact, I encourage you to continue! Although I haven't played any of these, I find it interesting that execs at EA decided to try and turn the last released Command & Conquer, Tiberium Twilight 2010, into a Real Time tactics game, similar to Ground Control, the politics aside, think for most part, it was an interesting experiment, which may have failed, given the sudden departure from classic RTS. I'd consider that a very pivotal point, since it's a clear example of many lessons, prime among them that people will resist innovation if you don't sell it right. There was a thread I read back then, where a person spun the entire concept of the game for an RTT, and set it in a different context. (which actually made some sense), which is not what EA did, which was try to tell people classic RTS didn't work in this day and age with the styles of today's trends. which come to think now, may be a very critical lesson, that sometimes in the game industry, you don't always get to work on what you want, and maybe not do things as you prefer, but your given a job to make the best of a bad situation, and you try your best. (there's an impression in the games industry, partly perpetuated by the companies themselves, that game dev isn't really work, and it is some how immune to classic business concerns, but from what I've heard, it's just new takes in the same old issues. I've spent years trying to fathom why C&C, a series with such promise and potential could have such a shameful official fate. Mainly if the failing to innovate stemmed more from the community's nostalgia or just the lack of freedom within the company. I think the real-time tactics worked well for Ground Control, at least enough that they chose to make a sequel (which was actually good). Myth II also had a similar approach, going as far as using fixed units (no unit creation whatsoever). Explain? Been in the industry for a while now, and I'm not sure what that sentiment is. C&C is part of EA now, where good products die slowly. It was born under Westwood, a company that once competed against Blizzard during its PEAK. I thought Planetary Annihilation added a cool new game mechanic to the RTS genre. Having multiple planets with multiple battlefields at the same time coupled with the interplanetary movment of troops and attacks. Too bad it was executed poorly and the interface was a mess. Good new mechanic in what ended up being a below average game. Given that I couldn't get many examples of games that followed in that trend I decided against going in-depth with Planetary Annihilation, but it popped in here and there while thinking about this article. Professionally, the game actually was relevant only a few weeks ago in fact! Was able to fix the images. Seems with all the site downtime, my latest saves didn't carry through! My point was PR for the games Industry tries to sell the impression that game companies are above traditional business issues, at least to the player base. I wish I could. Truth be told, I don't have half the fore-knowledge I have with RTS games to do this though. I was around during most of the "arms race" of the RTS genre, which means I've experienced most of this first hand, making it an easy write. Though I simply love turn-based strategy games (particularly some 4X), I don't have nearly the same breadth of knowledge and it would imply a lot more research and may be sub-par. Also, this was a particularly taxing article to write. As you can see, this 4 parter actually took over a year to get done, and I hate giving up halfway (hence why I was committed to finishing up with this part 4). The most common misconception I've seen modern players and junior designers exhibit about these precursors is the belief that they were barebone/simple experiences without much depth. From my experience, this could not be anywhere further from the truth, and oftentimes, I have come to realize that having a look at one of these "ancestors" humbles me. Wow VGA Planets, I forgot about that one. I think I had a shareware version I got off a BBS way back when BBSs were a thing. Was actually part of my article plan but cut from the actual article due to lack of meaningful content to add. It's a good game I haven't played in forever but this article wasn't a popularity contest and I wanted to convey more about dusty features becoming commonplace rather than niche ideas and felt Dungeon Keeper belonged in the latter category. That's not to say there's nothing meaningful to say about it, in fact, I encourage you to continue! First of all I would like to congratulate you on a well written and comprehensive article. I've one question to put out here. Why did you not measured or compared the fun factor in your article. Dune II besides being the forefather of RTS and the mother to all the mechanics was also a way for people to be part of the Novel, that made a complex game fun to play. C&C with all the cut scenes immerse you on the story and boost the fun factor. Dungeon Keeper does the same, with the parody. I've read the article and I was hoping to see that reference. Why there is no reference to the fun factor in this games, RTS and 4x games makes management and decision making fun, I think the new RTS are falling because they are overachieving in the competition factor, PvP and ladder systems and failing on the fun factor of playing a game that for it's genre has to be deep.